Photo by Lisa Fallgren-Stevens The "Granddaddy of Them All"
Except for some threats by a Mama moose and two calves (no actual encounters), and the unusually warm temperature (+41F), the third day of the Open went smoothly. Egil Ellis' 1999 winning streak continues, with Egil taking first place by a margin of 3 minutes, 48 seconds over Ross Saunderson. To learn more about Egil and his Scandinavian Hounds, read his Sled Dog Central Interview. Neal Johnson's performance was nothing short of astounding. Neal finished 3rd, but remember that his team was one of those that accidentally took the 30 mile extension on Friday. Under the same circumstances, Zev Chochinov did a fabulous job finishing 7th overall. The other three teams that ran 30 miles on Friday chose to scratch their teams from the race. To everyone's relief, the Open ran smoothly today. Unfortunately three teams--Hilpipre, Wood and Peebles--decided to scratch after yesterdays unintentional 30 mile run. Those of you who tuned in to the Internet broadcast at the appointed time found the archive from yesterday running. It was eventually linked to today's live broadcast and finished without a hitch. Egil's Scandinavian Hounds continue to perform brilliantly, leading a contending group of Ross Saunderson, Curtis Erhart, Neal Johnson and Sara Streeper. 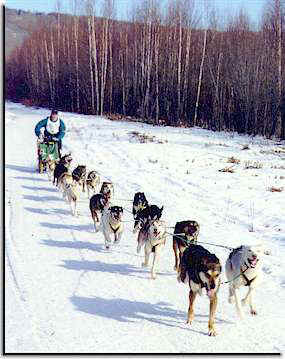 Tomorrow should provide some great mushing excitement! If you listened to the Internet broadcast, you got your money's worth! What a wild day! Teams going the wrong way, loose dogs, four and five teams in bunches, teams missing checkpoints...all I can say is "wow!" The mushers/judges meeting was just getting underway as we tuned out. The preliminary assessment is that the 30 mile gate, which should have been closed today, was open. The 20 mile gate was closed. It looks like the first several teams went down the 30 mile trail. According to reports on the broadcast, when Kathy Frost got to the gate there were four or five teams stopped trying to figure out which way to go. Apparently Kathy opened the correct gate and the waiting teams and those behind them took the right trail. We don't know at this point, but we're guessing that today's times will be thrown out and the race will start fresh tomorrow. As soon as we have a decision by the Race Officials we'll post it here! Friday times thrown out...race starts fresh on Saturday! During the first heat of the Open North American Championships, someone moved the snow fence at the 30 mile extension across the trail. The fence had been properly set by ADMA trail personnel but was changed sometime before the first team arrived. Because this act of vandalism effected almost half the teams in the race, race officials decided that times from the first heat will not count. Days 2 and 3 of the ONAC will be run as planned (20 and 30 miles) with teams starting day 2 in their original drawing order. Dogs may be dropped for day 2, but no fresh dogs may be added. Read the front page News-Miner article on Friday's race! KTVF Channel 11 will be broadcasting LIVE from the Open North American Championship Sled Dog Races! Fairbanks Evening News at 6PM and Newscenter Final at 11PM.